Gnam is a packaging out of the ordinary. It's a cardboard tube containing dry food for cats that has an incredible end-life transformation ability. 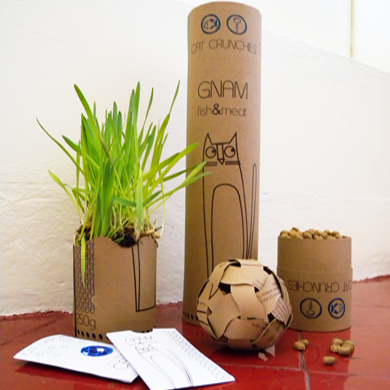 Gnam can be turned into a ball for your cat and a pot to plant some seeds of catnip. In fact, on the body of the pipe you can find a serie of die-cuts that allow you to "disassemble" the whole packaging in pieces: 6 strips and a little pot. The 6 strips allow you to make out, thanks to an very clever system, a small ball for your cat. With a little care you'll able to stimulate your creativity and give your little friend a funny toy to spend some time running around. The rest of bottom of the tube instead, becomes a practical little pot where you can plant the seeds of catnip you'll find as a gift in the double-bottom of the tube, just adding a bit of soil. Gnam, also provides a practical system of measuring the quantity of food that your cat needs, thanks to the measuring-plug and the infos on the back of the pack.